I love, love, love Tex-Mex food, but let’s face it, it’s usually not low calorie. Usually . . . I came up with this easy, yummy diet-friendly Tex-Mex recipe when trying to make stuffed peppers skinnier. I kept adding flavorful ingredients without realizing how Tex-Mex the result was! Eureka! Skinny Tex-Mex Stuffed Peppers! Chicken/turkey sausage is a real time saver because it’s already seasoned. I love it. I substituted black beans for the usual rice for their higher nutrition and how quick they are to add. If you prefer rice, use 1 1/2 cups cooked rice instead. Or add half beans and half rice. That’s yummy too! Optional toppings for individual servings after baking: scallions, chopped onions, hot sauce, sliced jalapeno peppers, etc. 1. Preheat oven at 400 degrees F. and prepare the vegetables. 2. Spray a medium skillet with cooking spray and turn the heat to medium. Add the sausage and break up into crumbles like you would for chili. You can use a potato masher on the meat in the skillet to make it faster and easier. 3. Brown the sausage and saute until cooked through, stirring as needed. Add a bit of water if necessary. 4. Add the chopped tomatoes, onions, black beans/rice, red pepper flakes (and corn, if used) and 1/2 cup of chicken broth. Cook on medium heat for 5 minutes, stirring as needed. 5. Turn off the heat on the skillet. Spray cooking spray on a baking dish with sides. 6. Place pepper halves in the sprayed baking dish. 7. Spoon the cooked mixture into the pepper halves, piling it high. 8. Top each pepper half with mozzarella. 9. Pour the other 1/2 cup of chicken broth into the bottom of the baking dish. Cover the whole baking dish with aluminum foil, sealing it tightly around the edges. 10. Bake in the preheated oven for 35 minutes. Remove from oven. Remove the stuffed peppers to a serving plate. Pass the peppers along with small dishes of toppings of your choice: chopped onions, hot sauce, sliced scallions, slices jalapenos, etc. Each half is about 200 calories and contains at least 24 grams protein. Carbs are approximately 20 grams per half. This makes 6 halves. You might be satisfied with one half if you are dieting and eating a salad with it. Hungry teens and men might go for 2 halves. I’d add a side of corn bread for them. You’ll have to see how far it goes with your family, but it is nice to have leftovers to take for lunch! Plan accordingly! Use whatever kind of cheese you like with this recipe, but check the fat content before you buy it. Red bell peppers have a sweeter flavor (and higher vitamin C) than green bell peppers. 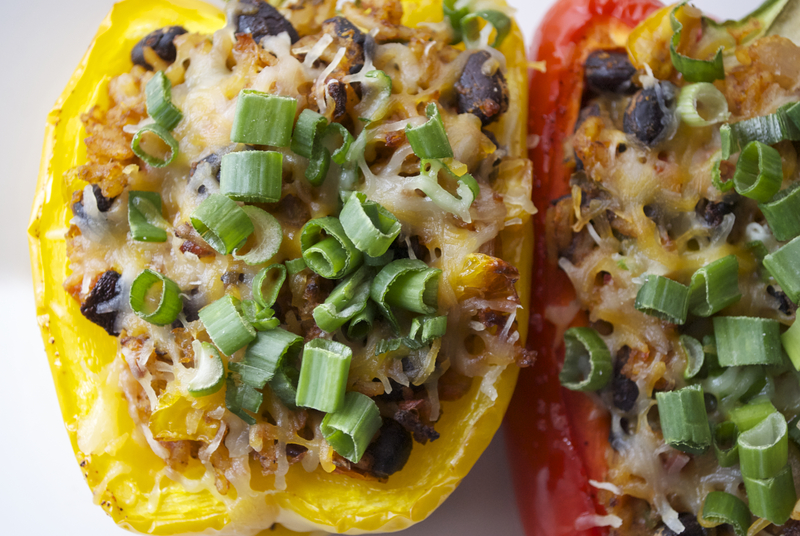 If your family doesn’t like the flavor of baked green bell peppers, try the red or yellow. They do cost more usually, but I find them at great prices at farmers’ markets. It’s a great project to grow bell peppers. Just leave them on the bush longer for them to turn red and yellow. So good. Peppers also make great snacks when served raw. Did I mention they have more vitamin C and much fewer calories and sugar than orange juice? Talk about a great diet food! Grown Your Own for Free! Any peppers are easy to grow, so plan to put a few in the ground or in pots this spring! Save the seeds from any kind of peppers you buy and you can use them to grow new plants for free. Just allow them to dry before storing them in a paper envelope. Mark the envelope with the type of pepper and they’re just as good as any seeds you buy. There’s nothing like the snap of a pepper straight from your garden! And the flavor is so much better than the ones in the stores too!